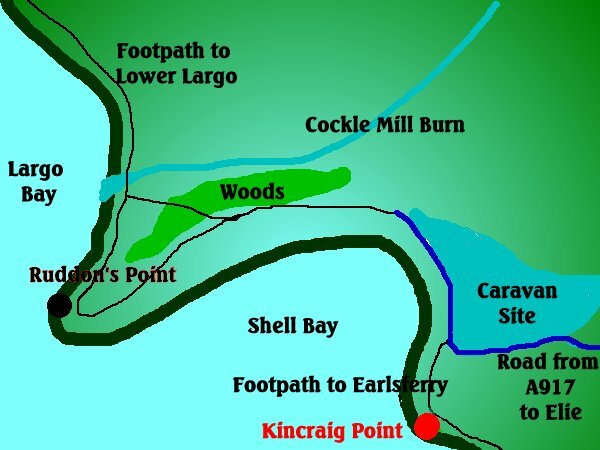 Follow instructions to Shell Bay for Ruddon's Point,but head out the footpath towards Elie as shown on the map. From Kincraig point you can either cast into Shell bay itself for flounder and mackerel,or cast directly out into the sea for cod,coley,flounder & mackerel. For a chance of bigger cod and pollack,winter fishing is best,but always remember the gates close at 4pm between October and March. Quiet conditions with a spring tide,and fishing 2 hours before,to 2 after high water produce the best,but there is sufficient water at any time of the tide to fish outwards.